View of houses near Tintern Abbey. Tintern was the wealthiest abbey in Wales, owning many estates. Most of the local inhabitants worked for the abbey. By the 18th century, the area was a mixture of impoverished local people and wealthy tourists, living side by side. 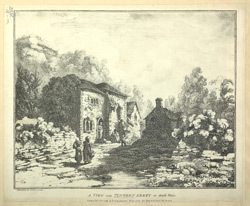 William Coxe, a clergyman who visited Tintern around 1801, said that he reached the abbey after "passing a miserable row of cottages, and forcing our way through a crowd of importunate beggars".